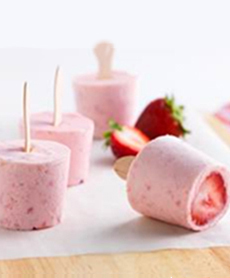 Make frozen strawberry cheesecake pops to celebrate National Cheesecake Day. Photo courtesy Philadelphia Cream Cheese. July 30th is National Cheesecake Day, and we’re baking our Cheesecake Recipe Sour Cream Topping, which happens to be our mom’s recipe. It’s a heavy cream cheese cake with a sour cream topping that isn’t found often these days—probably because most people don’t want to take the extra step. If you don’t want to bake any type of cheesecake, how about these Strawberry Lime Cheesecake Pops from Philadelphia Cream Cheese? They give you a summery cheesecake experience without turning on the oven. Not all cheesecakes are sweet, by the way. We love savory cheesecakes—basil, blue cheese, corn and provolone, lobster Gruyère, salmon and tuna. Serve one with cocktails, as an appetizer, or as the cheese course with a salad. They’re memorable! 1. PLACE a 3-ounce paper or plastic cup in each of 12 muffin pan cups. Cut each of 3 strawberries into 4 slices; place in the cups. 2. PLACE the remaining strawberries in a food processor. Add the cream cheese, lime zest, juice and sugar; process until smooth. Spoon into medium bowl. 3. BEAT the whipping cream in a medium bowl with a mixer on high speed until stiff peaks form. Gently stir into the cream cheese mixture. Spoon into the prepared cups. Tap the cups on the counter to remove any air bubbles. 4. INSERT a wooden pop stick or a plastic spoon into the center of each cup. If they won’t stand up straight, freeze for an hour and try again. 5. FREEZE for 4 hours or until firm. Remove the frozen pops from cups just before serving. Cheesecake (savory) was popular in ancient Greece. Neufchatel, ricotta and other soft, fresh cheesecake-friendly cheeses have existed in Europe for centuries, engendering a variety of savory and sweet cheesecake recipes. 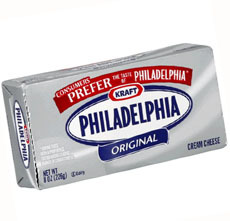 Cream cheese was invented by accident in New York, in 1872, and later given the Philadelphia brand name (learn more). In the early 20th century, the company promoted the first cream cheese cake recipe, and an icon was born. Cheesecake is actually a cheese custard pie. There is no cake made with flour, but a bottom crust like an open face pie. Cheesecake is often served with fresh or cooked fruit. Blueberries, mango, raspberries and strawberries are fan favorites. Want more? Take our cheesecake trivia quiz. Cream cheese is an American invention. Cream cheese-based cheesecake owes its popularity to Philadelphia Cream Cheese, which launched in 1872. The brand promoted the recipe on its packages. Photo courtesy Philadelphia Cream Cheese.